Conceived as a bit of fun at the end of the year the British Trams Online Tram of the Year originally sought to find the tramcar which had done something "special" over the previous 12 months. There has never been a full definition of what "special" actually means in this case but over the years tramcars which have won have had a repaint, entered service after a repaint or gone on loan away from their home tramway to name but there examples. 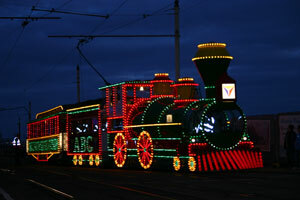 In 2012 the contest was expanded to include two new categories - Event of the Year and Tramway of the Year - and then in 2014 a fourth category was voted for the first time - Light Rail Vehicle of the Year. At the end of November each year nominations are opened for a week to allow anyone to put forward suggestions for each of the categories before our "expert panel" (which is probably neither expert nor a panel!) convene to make a decision of what should be on the final shortlist, with each category normally having around five items to vote on. Voting takes place for approximately six weeks from the start of December until mid January and we then name the lucky winners. At the start of a week when the future of the Douglas Bay Horse Tramway is set to be decided at Tynwald there is at least some reason to celebrate with the tramway winning two categories in the British Trams Online Tram of the Year 2016 contest. The Douglas Bay Horse Tramway received the most votes in both Tramway of the Year and also in Event of the Year (for the 140th Anniversary celebrations in August). Meanwhile Blackpool Marton 31 was voted in as Tram (traditional) of the Year with Manchester Metrolink 3120 completing a hattrick of wins in the Tram (modern) of the Year. Once again it is fair to say that none of the categories were particularly close with all eventual winners taking an early lead and staying there throughout the six week voting period. 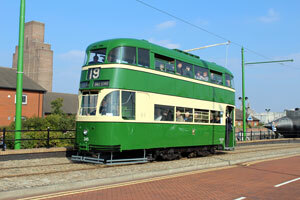 The original – and main – award saw Blackpool Marton 31 receive nearly a third of all votes for Tram (traditional) of the Year beating Sheffield 264 into second place (20.89%) and, perhaps surprisingly, Glasgow 1017 in third (18.38%). 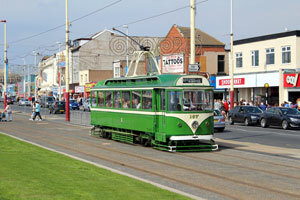 31 had, of course, been shortlisted as a result of its loan to Blackpool for the 2016 season where it had proved to be popular running along the Prom. The Tram (modern) of the Year has only been voted for over the past three years and in each of those years it has been a vehicle from Manchester Metrolink which has walked away with the accolade. 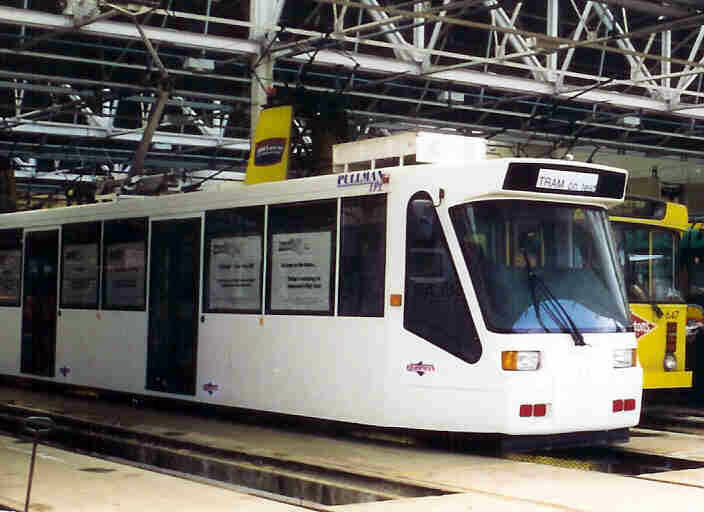 With only one competitor in 2016 M5000 3120 – the last of the 120 strong class to be ordered for Metrolink and now running in Manchester – received nearly 70% of the vote whilst Midland Metro 37 came in second place (unsurprisingly this tram received the remaining 30% of the votes). The remaining two categories were dominated by the Douglas Bay Horse Tramway, which had operated a successful 140th anniversary year in 2016 – a year which for a time it appeared it might never see. The Tramway of the Year was again just a two horse race but in one of the most one sided categories ever the Douglas Bay Horse Tramway received 82% of the votes to take a well deserved victory. 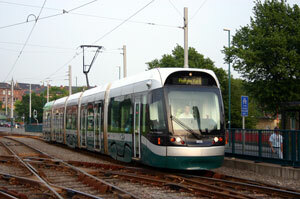 The other nominee, Midland Metro, of course received all remaining votes. The final category – Event of the Year – saw nearly half of you voting for the Douglas Bay Horse Tramway 140th Anniversary weekend which saw the rare use of two horses hauling double decker 18 and a Cavalcade including Toastrack 38 help to celebrate this significant anniversary. The action packed Anniversary Spectacular in Blackpool was in second with 26.23% of votes whilst a close fought battle for third and fourth saw Tram Day at Crich just pip the East Anglia Transport Museum’s London Event by one vote. But for now the British Trams Online Tram of the Year contest is over once again and let us give our congratulations to all of the winners. We will be back again later this year with nominations for 2017 opening towards the end of November so keep your eyes out for any potential nominees over the next 11 months! 31 started the year as usual at Beamish but just a few months into the year and it was on its travels to Blackpool for a loan period with Blackpool Standard 147 (see below) heading in the opposite direction. 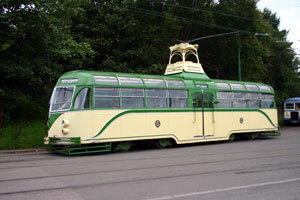 This is 31's third visit "back home" since restoration at Beamish and this time in doing so it became the first traditional open topper to operate on a modern tramway in the UK. The tram proved a very popular visitor in Blackpool with its open top often full especially when running all the way through to Fleetwood. For the first time since returning from the USA and its restoration 147 was on its travels with Beamish the lucky recipient as part of the exchange with 31 (see above). 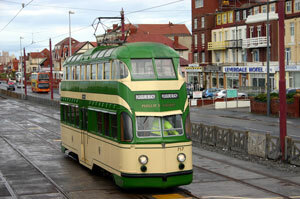 Arriving in the north east in time for the Great North Festival of Transport 147 soon settled into operation and as with 31 in Blackpool it proved to be a popular tram with its relatively large capacity vital to move the many visitors to the museum and having the added benefit of being completely enclosed. Despite the fact that it wasn't built until 1924 it certainly looked at home in the 1913 town. At first glance the shortlisting of Glasgow 1017 may look a little strange. The tram spent the majority of 2016 out of service requiring workshop attention following the discovery at the end of 2015 of a fractured axle box and then when this started to be attended to a host of other issues were also found (as always seems to be way in tram overhauls). 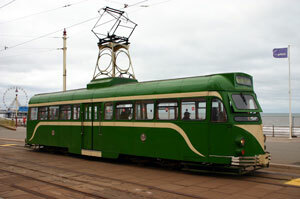 However the work was completed allowing the tram to return to use at the start of December and is included on the shortlist as an example of a small preservation group's efforts in maintaining a tram fleet. Shortlisted for the second year in a row 106 has made the 2016 final 5 as a result of its short-term loan to the East Anglia Transport Museum in Carlton Colville. In order to support the London Event during July 106 spent a week on holiday operating for the two days of the event as part of a two tram service with fellow London tram 1858. 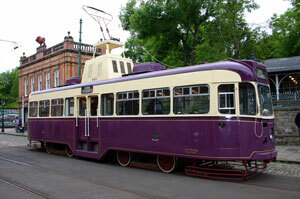 In doing so 106 became the first open topper to run there, was the first time a tram from the national collection was loaned to Carlton Colville and was also the first short-term loan of a tram to the East Anglia Transport Museum. 264 returned to the serviceable ranks at Beamish on 9th April after the completion of its extensive overhaul/restoration. Having last operated in 2003 the tram has spent the last three years undergoing its extensive work which had seen the tram split into three for a thorough overhaul to take place. Completed in a sparkling coat of traditional Sheffield livery the tram looked resplendent as it returned to action during the Great North Steam Fair; returning to what it does best - transporting visitors around the museum tramway. Since that initial foray into service 264 has settled back into service to become one of the mainstays of the operational fleet. The start of October saw the completion of the M5000 order for Manchester Metrolink with 3120 being delivered to Queen's Road Depot on Saturday 1st October. Following the usual commissioning and mileage accumulation work 3120 entered service on Sunday 23rd October. On Monday 30th May after many delays the full Midland Metro Birmingham City Centre extension opened to the public with Urbos 3 37 the tram chosen to do the honours of operating that very first service. With the suitable banner broken 37 operated the first service at 0800 with this line now part of the city centre environment. 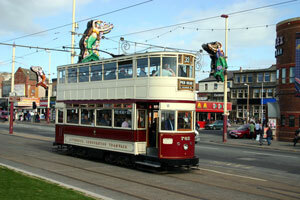 This time last year there was no indication of the dramas which would come for the Douglas Bay Horse Tramway. 2016 has seen so many ups and downs and this page isn't the place - or space - to go into them all. The year started with Douglas Council announcing that the tramway would close with immediate effect and then following a campaign it was revealed Isle of Man Railways would take on operation for at least two years. A reinvigorated tramway operated an extended season with a much improved timetable and in August a celebration of the 140th Anniversary of the tramway was held including a spectacular parade of trams. Despite this success the future of the full tramway continues to hang in the balance with the Department of Infrastructure announcing that they plan to abandon part of the tramway with the Prom reconstruction likely to see trams only run from Derby Castle to Villa Marina. The latest extension to open on a UK tramway was the full Birmingham City Centre extension with public services starting on Monday 30th May. This followed on from the opening of the first part of this line as far as Bull Street in December 2015. Having previously only reached the edge of the city centre the opening of this extension gave Midland Metro more visibility entering the heart of the city and hopefully increasing passenger numbers. Held over the weekend of 24th/25th September the Anniversary Spectacular built on the success of the 130th Anniversary event in 2015. With an excellent use of specials in addition to the usual timetabled service the weekend saw 20 different trams in action. Unfortunately the weekend was marred by the fire suffered by Twin Car 272+T2 and a derailment by Boat 600 but even these incidents did not spoil what was a well organsied event which also included depot tours and tram line-ups. Renamed for 2016 Tram Day at Crich continued the tried and tested formula of an extensive tram service coupled with photographic line-ups of rare trams in the open. The main theme for 2016 was changes to the collection with Oporto C65 making its one and only public appearance whilst part of the national collection. It was displayed on the depot fan along with other works vehicles and the other Oporto trams in the collection as well as on its own. Shortly after the event it was off to Beamish and its new life. 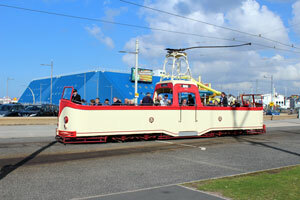 To celebrate 140 years since opening on Sunday 7th August the Douglas Bay Horse Tramway held a special event. 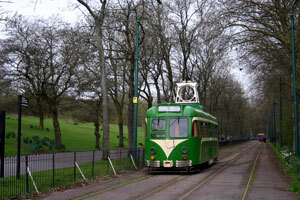 Included on the day were two runs of double deck tram no. 18 - complete with two horses at its head - and a nine tram cavalcade. The cavalcade included Toastrack no. 38 which hadn't operated in service for several years along with some of the more common members of the operating fleet. 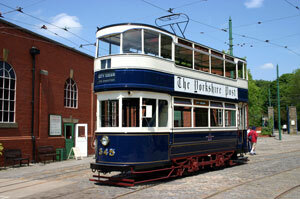 In addition to the cavalcade trams were also displayed outside the tram depot and there were tours of the stables. Held over the weekend of 9th and 10th July the London Event was not just tram orientated with the four London trolleybuses resident at the East Anglia Transport Museum also in service alongside buses and other vehicles associated with the capital. But for us the highlight was the loan operation of London County Council 106 which ran the two tram service alongside London Transport 1858 throughout the weekend - the first short-term tram loan to the museum, the first open topper to run at the museum and the first tram from the national collection.